Catholics traditionally consider May the "Month of Mary," and give special honor to her. While on the Cross, He entrusted us to her (John 19:26-27), making her our Mother as well as His. This month, Jude is working on a Mary-themed lapbook. Jude does better with bigger spaces to work with, so we are using folded easel paper, but this could easily be done with the more common file folders. Fold the paper (or folder) in half, and crease. Open the paper flat. Bring the left and right edges to meet at the center fold. Crease. This is the interior of your page. Repeat for each page of the book. Staple or glue the right "wing" of the first page to the left wing of the next, and repeat until all the pages are connected. 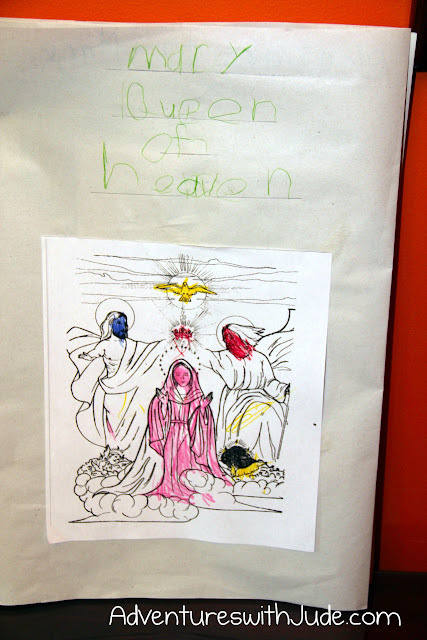 We pasted a coloring page picture of the Coronation of Mary to the front "cover." 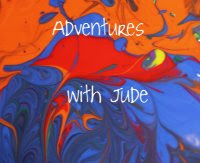 I started out with a basic idea of what I wanted to teach him. Our book will have three "pages". The first is "Prayers to Mary." We finished that one this week. We included the Hail Mary, Hail Holy Queen, and the Miraculous Medal novena. 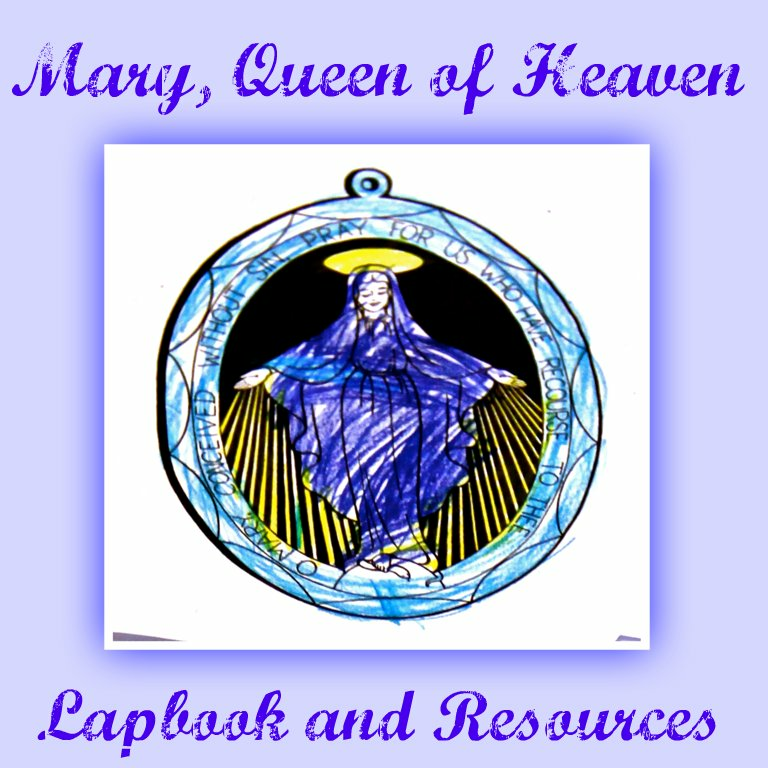 Since I could not find lapbook-sized pages, I created a copywork version of the Hail Mary, a copywork cover/printed prayer Hail Holy Queen, and a printed Novena prayer. 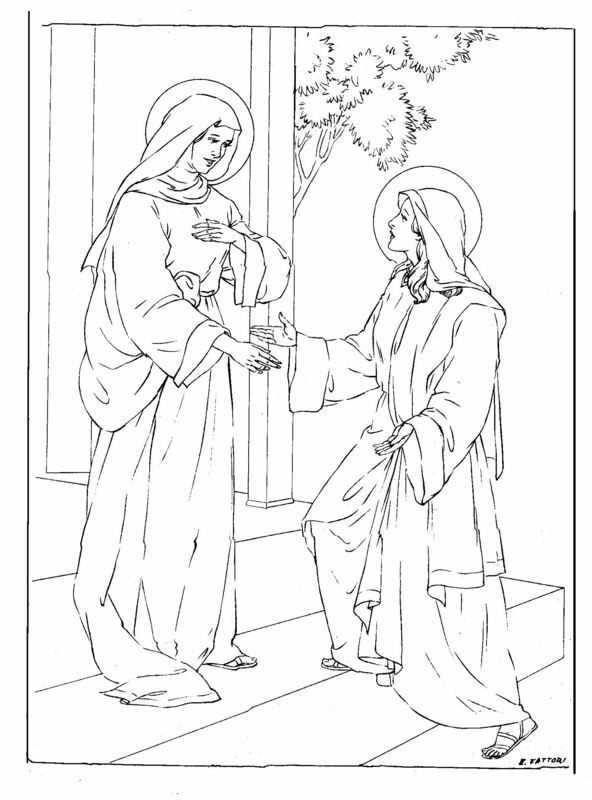 We also added coloring pages of the Rosary and the Miraculous Medal. 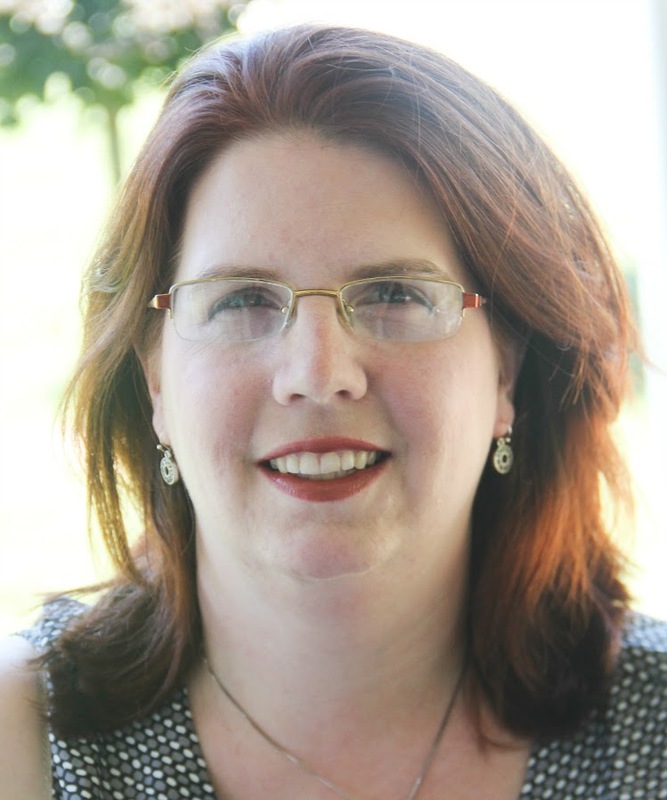 We used the pictures linked here, but did a little resizing so they would fit properly. Next week, we are going to work on the second page of our lapbook. The theme will be "Titles of Mary." This year, we will just cut the pictures out and write Mary's titles. An older child could write a few sentences about why Mary has been given a particular title, or copy specific devotional prayers asking for our Lady's intercession. 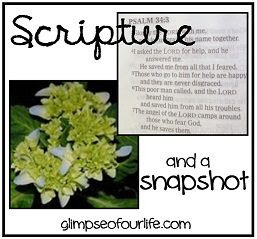 Cut a blank page(s) to fit under the picture, write the facts/prayer, staple them together and glue the bottom page into the lapbook. The third folder in our book will be "The Life of Mary." We are going to include the Seven Joys and Seven Sorrows, and some pictures of Mary's life. -the Seven Sorrows (from Catholic Icing). The Seven Sorrows is actually a standalone craft; we are using just the Sorrows page and pasting it into our book. 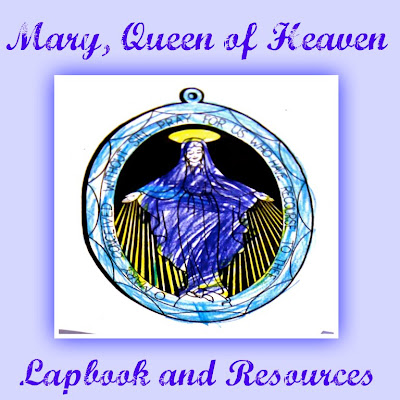 You can also find other ideas to add to a Marian Lapbook on our Pinterest board, Mary, Queen of Heaven Lapbook. Through the intercession of Mary, Jesus' Mother and our Mother, may God grant you abundant blessings! I have to disagree with you. Jesus, didn't entrust us to Mary, He entrusted Mary to John. He honored His mother and loved her so much that He made sure she was taken care of after His death on the cross. However, as a Roman Catholic, I still maintain Jesus named Mary all of our Mother. In fact, this is stressed in Catholic Canon Law. Section No. 1186 deals with veneration of saints, and the Church specifically refers to her as "the the Blessed Mary ever Virgin, Mother of God, whom Christ established as the mother of all people..." Pope John Paul II further reiterates in the 1983 update of Canon Code: "I therefore exhort all the faithful to observe the proposed legislation with a sincere spirit and good will in the hope that there may flower again in the Church a renewed discipline and that consequently the salvation of souls will be rendered ever more easy under the protection of the Blessed Virgin Mary, Mother of the Church." Jesus entrusted the immediate physical care of His mother to John the Beloved, but John became a representative of all the Church, making Mary not just the Mother of God, but the new Eve (see http://www.stpeterslist.com/682/6-biblical-reasons-mary-is-the-new-eve/ for how Eve and Mary are paralleled in the Bible) and Mother of all.